Leif Svalgaard came up with this link in a discussion on wattsupwiththat.com which I found very interesting. When corrected for the effect of magnetic solar activity, the solar oblateness is just what is expected from current solar models and solar rotation. Thanks for the link Leif. One of the things I find interesting from that press release is the rapidity with which the 6km high lumps around sunspots smooth out again to the average oblateness. The Sun’s outer layers are obviously very fluid and mobile, so it would be expected that any internal lumpiness raised by tidal or gravitational forces from orbiting bodies would be compensated for quite quickly at the surface in flows from the low mid latitudes to the equator, which might explain the shifting of sunspots towards the equator throughout the solar cycle. The vertical tide on the Surface raised by the biggest of the orbiting bodies is only in the order of mm as you have pointed out before. However the horizontal tides are much bigger, in the order of hundreds of km. 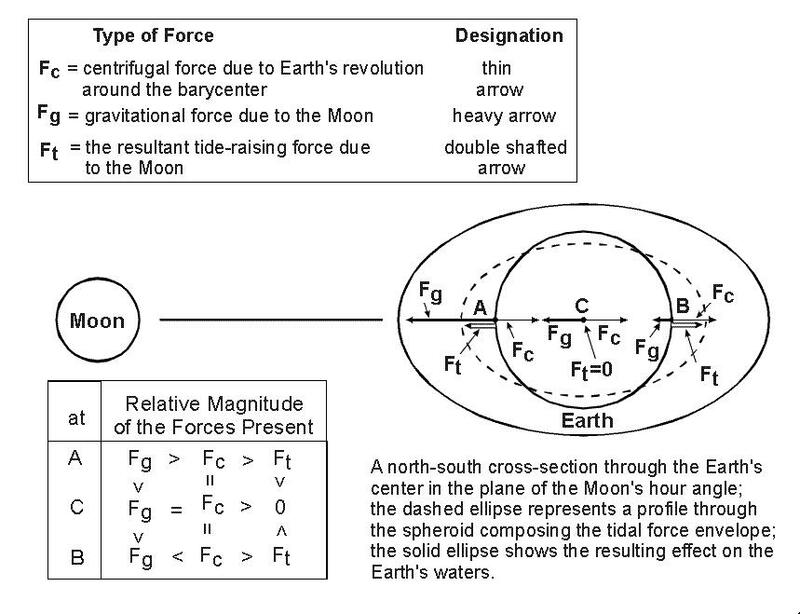 Much the same as the Moon’s tidal action on the Earth, it is the horizontal tides which will cause most of the rising and falling of the surface. Further analysis is showing that at perihelion, Mercury causes a much bigger horizontal tide on the sun than Jupiter does. So does the synodic variation of Earth and Venus. Work on quantifying these and looking at their periodicities and phasing is ongoing. Any shifting around of the interior would introduce a quadrupolar moment which is not observed. The constraint on the quadrupole moment (2+-0.4)10^-7 isn’t so tight as to be able to be definite about that. Quite small movements in the dense solar interior would set up much larger flows on the much less dense solar surface. Tidal effects have been dismissed as too small to have any effect on the Sun in the past, but new research by Semi and others may change that view. I’m posting this thread to provide a place for discussion, however speculative at this stage, concerning the possible effects of tides raised by planets on the surface of the Sun. There is a provisional page (mine), showing some animations of tidal forces on the solar surface: Animations of tidal forces on Solar surface. Some discussion, charts etc… will be added soon. Due to current research of K.Georgieva, despite that the vertical component of the tidal forces is almost negligible, the horizontal component of the tides may influence (brake) the meridional flows by as much as 20m/s (when accumulated over the length of the 11-year cycle), which difference in the flow speed is said to be actually observed… Her research says, that influencing the meridional flow of magnetic field toward equator in the maximum phase of current cycle influences the strength of the next cycle. Hi Semi, great animations, thanks for posting this. Maybe we could use a batch conversion program like the fastone image resizer to convert the .png files to .jpg and then to mpg? I’ll try an experiment and let you know. If it works out, I’ll get the .png’s from you and host the mpg’s here to save space on your server. One question I have: The sun has a ~7 degree tilt to the invariant plane, but the sunspots seem to run parallel to the invariant plane. Will there be a coriolis effect which also causes a flow from the low mid latitudes to the equator? I’m again sorry for an error, the page was tested on local windows workstation, but the “gallery” site is on Unix with strict-case filesystem and the AVI files were bad links… (probably you looked only to the WMV sample, which had the file-name case correct). There is no problem converting PNG to JPG, just the MPG software is missing for me (I’ve found some open-source converter, but it reads only PPM files…). No need to apologise, I am very happy to wait until you have time and thank you again for taking the time to share your work with us. If I can convert the files, I will host them here on the wordpress server, which has plenty of room and bandwidth. Edit: I downloaded an avi but WMP won’t play it, and quicktime says it needs another codec, but doesn’t tell me which one! I will try to convert the file…. Very interesting. Those wavefronts, whatever they are, are moving at high speed. Each frame is ten mins apart and the fastest moving waves cover around 1/12 of the solar disk in that time. That’s around 600,000km/h! I don’t know what is being monitored, but it’s not an impact, as the waves propogate from both poles of the Sun simultaneously. They’re certainly strange although possibly a recording malfunction. Maybe so, since the equipment seems to be measuring polarisation effects. Having said that, magnetism moves fast, and magnetically re-orientated plasma will react fast, with polarised indicators. It seems unusual that the organisation collecting the data would publish the time-lapse movie if they knew it to be an artifact of data collection though. It proposes a mechanism whereby the planetary tides might be amplified by resonance in the periodicities involved. I think this is very promising. The tides in Maine average 9-10 feet. Last January 2010 there were days when the tides were 2-3 feet higher than we’ve experienced in the last 40 years of living here. I speculated that venus was close to the earth and was aligned with the moon so as to cause the higher tides. Is there any validity to this idea? Was it 2-3 feet higher at low tide too? If so I wonder if it was a storm surge. I doubt Venus being in line would make that much of a difference. Ian Wilson’s paper (which I saw later),took another line of inquiry, highlighting the particular alignments that are associated with varying activity within the sun. I believe our conclusions are closely related, but I have only partially pursued the possible connections. Sorry, that should be Ching-Cheh Hung. where there is onging discussion with Jean Pierre Desmoulins among others. I will repost your message there, please join us on that thread.